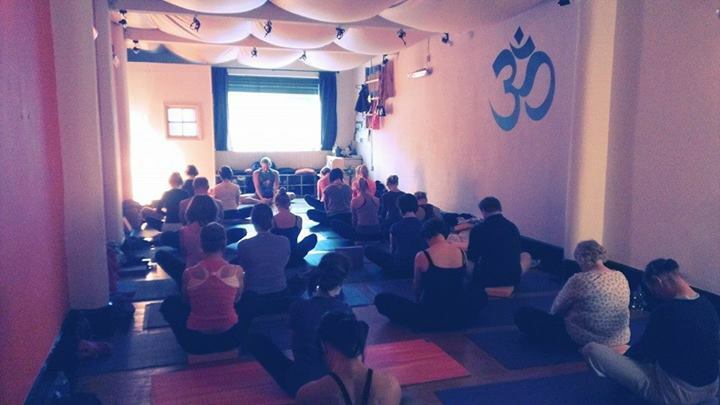 Fluid & Delight – Yoga Workshop with Andrew and Francesca. Sunday 28th of September 2014 – 10.30 to 4 – one hour break to explore the lovely Treacle Market in Macclesfield Town. The day will include fluid sequences of postures (Continuous Flow), Pranayama and Meditation. All practices will be explored with playfulness and a deep sense of self inquiry. You will be challenged and delighted and you will find your “edge” in this juicy event that promises to be profound and fun. 10.30 – 12.30: Asana, Bandha, Mudra, Mantra. Bandha, Mudras and Mantras are powerful tools to plug into deeper awareness. Asana (yoga postures) will be fluid and will include inversions – or preparation for inversions, according to one’s level. Prana (vital energy) will be stimulated in this revitalizing practice – perfect to support body and mind during the change of season. 13.30 – 16.00 – Asana, Pranayama, Mantra, Meditation. Complementing the revitalizing nature of the morning’s practice, we will move into more introverted practices including classical Pranayama (breathing) to awaken the flow of our inner energy (Shakti). Some long held postures to prepare the body and to settle the mind into a guided Meditation. Finishing with Relaxation and some time for questions and answers. Yoga is better practiced on an empty stomach. We suggest you have a moderate breakfast one and half hour before starting the practice and a light snack at lunch time, planning to have your main meal after the workshop.